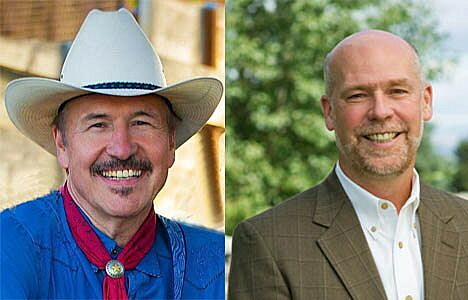 Democrat Rob Quist, left, and Republican Greg Gianforte will square off in a special election for Montana’s seat in Congress. As Montana gears up to elect a new congressman to the U.S. House, a Missoula organization is calling on the two appointed candidates to support an amendment to the U.S. Constitution saying corporations aren’t people and money isn’t speech. Missoula Moves to Amend points to a 2012 ballot initiative in which 75 percent of Montana voters instructed the state’s congressional delegation to support a possible 28th Amendment, ensuring that people – not corporate money or special interests – have the greatest say in the nation’s capital. This week, Montana Republican leaders gave their party’s nomination to technology entrepreneur Greg Gianforte. Likewise, Montana Democratic leaders put their faith behind political newcomer Rob Quist, a musician best known for his role in the Mission Mountain Wood Band. With the candidates now selected, advocates of a constitutional amendment are calling on Gianforte and Quist to “Stand with Montanans,” and they’ve begun circulating a petition under that name. It has the support of former state Supreme Court Justice Jim Nelson, former Lt. Gov. John Bohlinger and former Bozeman mayor Jeff Krauss. Like Montana, 18 other states and nearly 800 cities and towns across the country have called for passage and ratification of the 28th Amendment. Advocates suggest the grassroots support demonstrates strong bipartisan support for change. In Montana, each of the state’s 56 counties passed I-166 in 2012. “No matter what political party the new member of Congress comes from, they should Stand with Montana and support a 28th Amendment to the Constitution to overturn Citizens United and set reasonable limits on election spending,” said Kirchmyer. Tina Olechowski, spokesperson for Quist, said the Democrat supports the amendment. Gianforte’s campaign could not be immediately reached for comment.